You are here: Home / Search / SEO / Editors Going Extinct or a New Breed? Having recently taken up blogging I have discovered one major issue. There’s no editor. Nobody to really ask you is this what you really mean to say? It’s a simple click publish and there it is your article up and out there live for everyone to see. I know at some point I’m going to have publishers remorse. I’ll go back and read something and think “that is not what I meant to say” or “man that was worded rather poorly”. So what does all this mean in the larger scale of things? What does this mean as digital publishing becomes the defacto way of getting content out to the masses? It means one of two things either the internet will be the end of dedicated editors, or we are going to need a new breed of editors. Sites like Wikipedia have shown what the masses can do when acting as a group to collaboratively edit content, but what about the solo publisher? What happens to the novelist who self publishes electronic either through a blog or to an e-book or some other electronic form? Are we going to have to teach our children better editing habits in school or will we devolve into some 16th or 15th century publishing practice where everyone runs amok and we start to see new words invented either intentionally or unintentionally. I already see a lot of portmanteau words showing up to describe new things on the web. I also see new words showing up due to lazy typists. It’s a strange topic for me; as an English Major I had always focused on getting the idea across and was never worried about the spelling, punctuation or grammar. That’s not what a writer did as far as I was concerned that’s what an editor did. Clearly that was a wrong and bad decision on my part back then. Who’s Going to Fix All That Grammar? Language is meant to evolve and the advent of electronic publishing is a very exciting prospect for me. There is a richness of words on the web that has yet to be tapped. I think there are a great deal of authors, thinkers and intellects who we may never have had the opportunity to be exposed to without the internet. However there are still a great number of people who are publishing their thoughts unedited and unchecked, and that can lead to some of the greatest thoughts being lost due to poorly written articles or expressions of thought. The editor is needed now more so than ever before. One of the worst things one can do is edit their own work. It simply doesn’t work for 99% of the people out there. Reading your own words and wordsmithing them rarely works. The editor is the second set of eyes, the cricket on your shoulder that asks “are you sure you want THAT out in the wild?” Perhaps these are the tools that the next Office Suite needs from Microsoft (I kid for thanks but I don’t need clippy editing my content). What we do need is an editor that will take your work and make your thoughts crisp and clear. Help mold your language into that of your audience. With out the editor I’m afraid we will see more noise and sound on the web that will be difficult to decipher as good content. With SEO specialists these days recommendations are being made that will corrupt the style of witting that is natural. Focusing on getting top rankings in Google by ensuring you have mentioned your target keyword 5-7 times in your article and once in an H1 tag, has the writer focused on getting that word count pumped up to satisfy Google. A human editor might look at that same document and suggest several synonyms for that same word used 5-7 times to keep the article fresh. Our SEO editors would have us write to the bot and not the human reader. This leaves us then with the problem of if you don’t write for the bot, then the human can never find you, what’s a writer to do? I say that whatever these “SEO experts” are telling you to write should broaden their skills and not worry about “gaming” the system and packing content with key words, but focus on writing clear concise articles. Articles that are interesting to read. Search isn’t the only way to be found anymore. Word is spread by People just as much as Google. Twitter and other social media sites share links rapidly and people share the content that is interesting to them, not the search bot. If people share your content then at some point the bot will be bound to listen to your followers, that is where you’re better off focused. If the people read it the bot will come. So what should a good editor do? Aside from getting you to write to the people and for the people. An editor I think has a bigger task today than they ever had before. Your editor needs know everything that you’ve written before, and be able to work with you to also know what you are referencing. As writing moves to an electronic format an editor needs to not only be able to work on your current copy and articles, but that editor needs to be familiar with your larger canon of work as well. Especially as we move into the digital age. that would appear in comics all the time where a character would be talking about an incident that happened in another comic or a past issue to update readers who weren’t familiar with the whole canon of that story or publishing company. They would provide reference to where you could learn more about that particular back story. 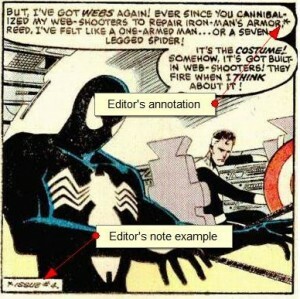 A good web editor needs to be able to do the same thing. They need to work with the writer to provide links to readers of where they can learn more about certain articles, stories, events or anything else of reference that may make the story or article richer to the reader. In the next 10 or 15 years linear reading will be on it’s way out. It won’t simply be, read a book from start to end, there will be side journeys for the reader as they approach the end. They can decide if they want to read further or if they want to just plow through to the end, or if they want to get to the end and read the supporting articles later. Having read the Da Vinci code and then finding the version that includes pictures and maps of all the art and city scapes referenced in the book, the later was a richer experience to me. The internet enables this, and an editors job will be to bring this all together. I just hope they don’t go the way of the woolly mammoth before it’s too late. Interesting, but have you ever worked in book/magazine publishing? Having worked in that industry and having friends who are editors of that medium, they would probably pat you on the head and send you on your way at your thought that they are a dying breed. No doubt, the digital world calls for a new kind of editor, depending on the forum that needs editing. It’s naive to assume, but people should always question the source of what they are reading online. A blog writer doesn’t need an editor, but good writing skills and habits. Write a post, but don’t publish it. Leave it and come back with fresh eyes so that you can catch something like this, in your sentence, “Your editor needs know everything that you’ve written before…” Come back and add the “to”. Common mistake that only needs proofing. Editors don’t suggest several synonyms, as you’ve implied, they just make the change. Authors sign over most decision making to the house. (9.5 times out of 10, the author doesn’t even get a say on the design for the book cover.) Unfortunately, or not, the internet has opened up the door for all people to take on the role of writer; talent or not (and in the majority of cases, not). This is not an editor’s issue, but one for the reader. It might be old school of me to think this, however being under 30 and not old by any means, I believe that self-publishing a book or being a blogger does not mean one is a writer. It means you’ve accomplished something, you have a hobby and you want to share your thoughts. This deserves credit for that in and of itself. To take on the title of writer though demands more work than the above mentioned forms, and to believe that one needs an editor would imply that the work is worthy of such attention. And this, my digital friend, demands blood, sweat and tears from the writer, a life’s commitment, the years it takes to create a career… not a hobby. Dude, what’s up with the formatting? Hmmm that formatting thing is weird. I’ll have to look into that, I suspect it’s a WordPress plug-in doing this but something’s injecting line breaks when it shouldn’t be. (Ironic that the code is deciding how to edit your comment given the topic). I’ve done some freelance stuff in the past in traditional print (nothing big, but all newsprint, not magazine or book). The publishers were big enough that there were several layers of editorial staff in some cases. What I found interesting is that the smaller outfits would just make changes and not even let me know. I didn’t even know about the changes until after I’d read the article. In one case the edits actually injected errors and screwed up the name of a cited source. With the more professional (or at least what I felt to be) publishers they would at least send me a copy of the edits they had made before I read it in final print, these were also newspapers with larger circulations. This may just be a work ethic of some editors, I’m not sure. What does concern me though as I started to think I’d like to write again, and started to look at sites that accept articles from freelance writers, what struck me was that a lot of these sites were stating in their criteria they were basically looking for an all in one writer/editor. This seemed rather alarming to me and really what inspired this article. For offline today I know it’s not the norm, but it seems to be a trend I was at least noticing for online publishing, and to be honest that worries me. Maybe these sites were trying to weed out the weak solicitations. I guess as we see the move from offline publishing to online publishing the Editor’s roll will change, as you pointed out the writer has no input on the cover of a book, online there is no cover of a book. Finally and I know this upsets some people in traditional print but traditional print is a dying medium. More books may be sold now than ever before, but newspaper and magazines are seeing their print runs go lower and lower. People are more inclined to go online to consume this sort of content. I think for books to make the leap to digital it’s going to take the evolution of e-book readers to really make that happen, but that is just a time game, and then we will see book print runs decline as well (not sales just the publishing process). The risk I guess of digital is I’m seeing it really change the assembly line of how works are published. On a side – dumb things I’ve done: write an article on editors and not proofread the hell out of it. I’ve fixed the formatting for your comment. I hope it sticks.